The lawmakers, in unusually blunt terms, urged the administration to use its influence within the IMF to end failing Belt and Road Initiative projects and prevent future deals. 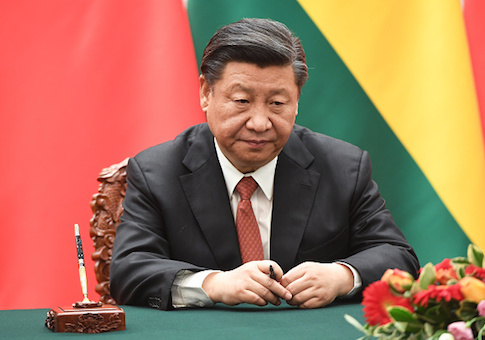 Chinese President Xi Jinping asserted in announcing the Belt and Road Initiative last year that the program posed no threat, and that China would not use the program for hegemony and expansion. "It is apparent that this statement is fundamentally false, and that the goal for [Belt and Road Initiative] is the creation of an economic world order ultimately dominated by China," the senators said. "It is imperative that the United States counters China's attempts to hold other countries financially hostage and force ransoms that further its geostrategic goals," they added. The letter was signed by 14 Republicans and two Democrats, including Sen. David Purdue (R-Ga.). The IMF is an international lending institution and the United States is its largest contributor with some $164 billion in financial commitments. In 2016, the IMF agreed to pay Sri Lanka a $1.5 billion bailout loan to cover debts the country owes China. Recently, Pakistan's government said it will seek INF funds to help finance some of the debt owed to China as part of the Belt and Road project called the China ­Pakistan Economic Corridor (CPEC). "These financial crises illustrate the dangers of China's debt­ trap diplomacy and its Belt and Road Initiative (BRI) to developing countries, as well as the national security threat they pose to the United States," the senators said. Secretary of State Mike Pompeo said last week that some of the countries engaging China in the infrastructure plan are now facing difficulties. On Pakistan, Pompeo said he is aware the new government there may seek IMF bailout money. "Make no mistake, we will be watching what the IMF does," Pompeo told CNBC. "There's no rationale for IMF tax dollars—and associated with that, American dollars that are part of the IMF funding—for those to go to bail out Chinese bondholders or China itself." A report by the Center for Global Development in March warned that China's $8 trillion initiative involves 68 nations in projects involving transportation, energy and telecommunications infrastructure development. The report said 23 countries are facing "debt distress" from participation in the program with eight at high or significant risk over their indebtedness to Chinese state-controlled banks. They include Djibouti, Kyrgyzstan, Laos, Maldives, Mongolia, Montenegro, Pakistan, and Tajikistan. The infrastructure financing initiative "will also serve key economic, foreign policy, and security objectives for the Chinese government," the report said. "As financially strapped countries negotiate with China to free themselves of mounting debt, Beijing has extracted onerous concessions, including equity in strategically important assets," the senators said. "Further, Beijing has repeatedly used economic pressure to affect foreign policy decisions." In Djibouti, where China has its first overseas military base, the government has incurred large debts in China. "As Djibouti increases its dependence on China, there are fears that China will gain control of the Doraleh Container Terminal, further consolidating China's influence in the critically strategic region," the senators said. In Sri Lanka, the government was unable to repay over $1 billion owed to China for construction of a key port at Hambantota and as a result gave a Chinese state company a 99-year lease on the port. The senators said they are concerned about similar concerns that Pakistan's growing Chinese debt could result in a Chinese takeover of that strategic port facility. "In China's ‘String of Pearls' strategy for the Indo-Pacific, Gwadar and Hambantota are important footholds that if converted into naval bases will enable the PLA Navy to maintain a permanent presence in the Indian Ocean," the senators said. The Pentagon several years ago identified what it called China's "String of Pearls" strategy of developing bases throughout the Indo-Pacific to facilitate Chinese power projection. The senators asked Treasury Secretary Steve Mnuchin and Pompeo about their plans to raise the issue of predatory Chinese lending with the IMF and whether other states will seek IMF funds for bailouts. Pakistan last week dismissed U.S. concerns about IMF bailout funding. "First and foremost it is totally wrong to link the IMF package with [China-Pakistan Economic Corridor]," the finance ministry said in a statement, Reuters reported. "It is affirmed that Pakistan government is fully committed to undertake and complete CPEC projects in their totality. Third parties cannot weaken our collective resolve to make CPEC a success story." This entry was posted in National Security and tagged China, Trump Administration. Bookmark the permalink.